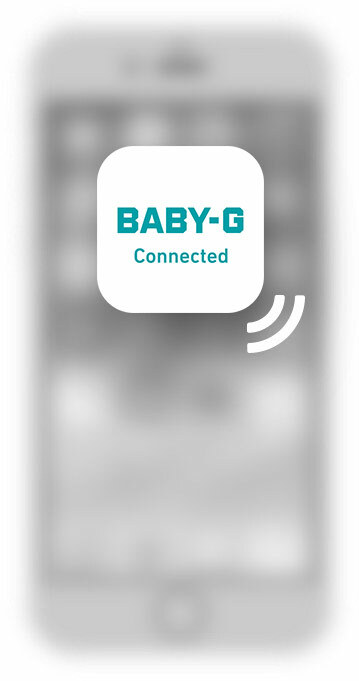 Download the free app for your BABY-G. 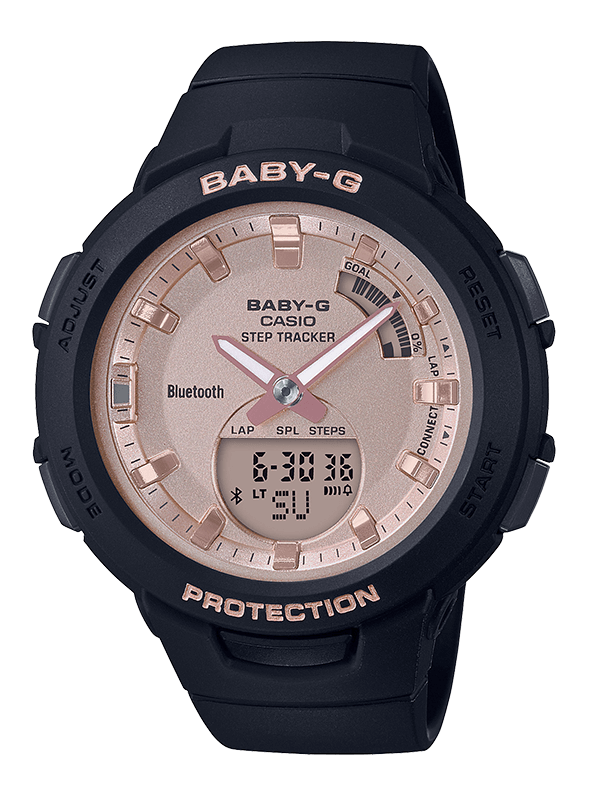 The watch is equipped with energy-saving Bluetooth® technology, which offers power-saving data transfer at the push of a button. The watch can connect to a smartphone wirelessly via Bluetooth®, enabling access to a wide range of useful functions. Local time will automatically be adjusted whenever the watch is connected with a smartphone. 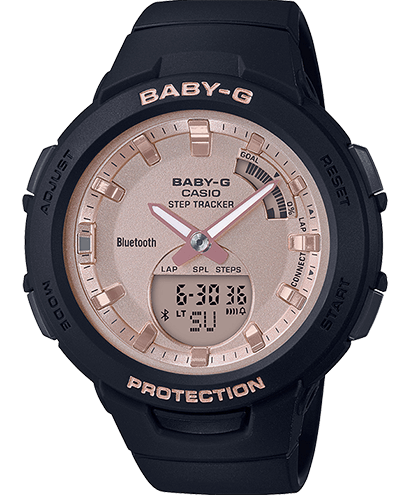 The watch has a built-in 3-axis accelerometer that counts the steps you take and indicates the numbers on the display. The daily step target can be set in a range of 1.000 to 50.000 steps. After reaching the predefined goal, the watch will remind you with an signal. Measured total, lap and split times can be stored in a memory with the date and can be displayed again later. A data set consists of: date, total, lap and split times. The memory has enough space for up to 200 data sets. This timer emits a signal after the set time has elapsed. The watch can count down from a maximum of 60 minutes. Five countdown timers can be set separately. They then count back automatically from the preset time. With a push of a button, hands are moving and permit a free visibility of functions like stopwatch or date. Misplaced your smartphone? All it takes is the push of a button on your watch and the smartphone sounds an alarm. Perfect for swimming and snorkelling: the watch is water resistant to 10 bar according to ISO 22810. Availability of models and/or lineups may differ depending on the country or region. Technical amendments and errors excepted. The sizes in figures do not correspond to the original sizes. The colours may differ slightly from the original.